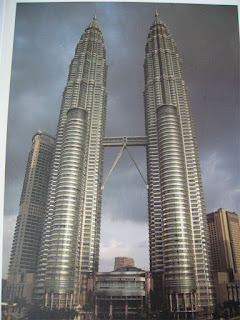 Visiting Petronas Twin Towers was one of the things that I was excited and anxious about in Kuala Lumpur! 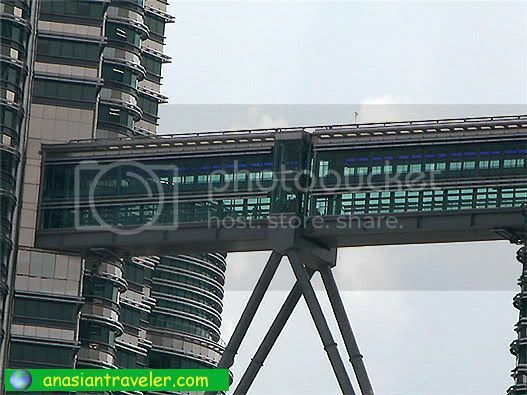 Aside from being the world-renowned icon of modern Malaysia, it has been featured in the most notably blockbuster 1999 film "Entrapment" starring Sean Connery and Catherine Zeta Jones. Hb and I skipped our breakfast and headed to Petronas Twin Towers early in the morning. We just walked from our hotel to Petronas. The Sky Bridge visit entry point is located at the concourse level (in front of Maybank) and it was still closed at 7:20 am but there were already around 15 people in the waiting line. Before we knew it - queues start enormously forming early by 8:00 am. The Free Admission tickets are available on a first come first serve basis at 8:30 am. Only 1,300 tickets are issued per day. 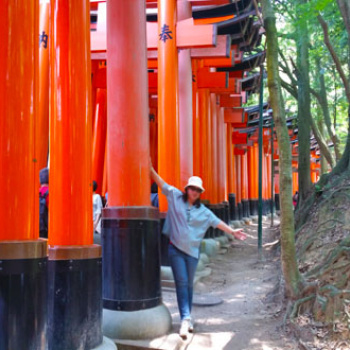 Each visitor is entitled to only one ticket, and one ticket entitles to only one admission. Visiting hours are from 9:00 am to 7:00 pm daily except Mondays. No tickets are issued for advance dates of visits. 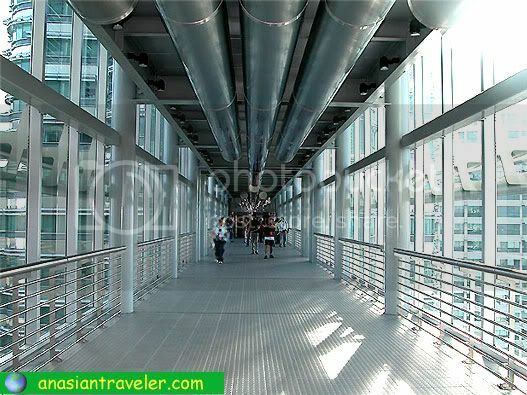 After waiting for almost more than an hour, we finally got our chance to go up on this famous SkyBridge. We were divided into groups around 10-12 people per session. We were brought on the bottom 41st floor - the sky bridge that connects the Petronas Twin Towers at KLCC. The top level is off-limits, both were put in place for the safety of the workers, as it can be used as an escape route from one building to the other for the upper level employees. 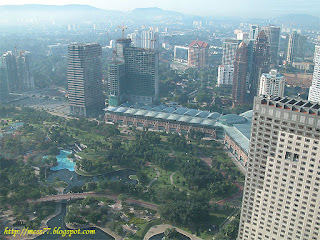 We had a bird's eye view of the city (170 meters above the ground). The guide gave us only 15 minutes to appreciate the place and take photos but it was more than enough time for us to catch a few great pictures without rushing it. Viewing starts at every 15 minutes interval from 9:00 to 9:15 to 9:30 and so on. 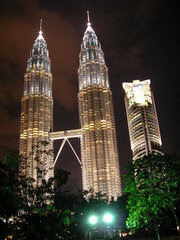 Completed in 1996, the 88-storey PETRONAS Twin Towers stand tall at 452 meters above level. The structures are currently the tallest twin towers in the world. 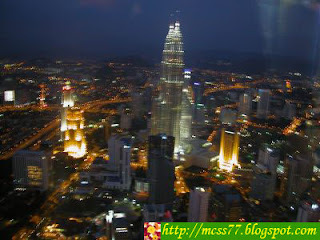 The Towers are significant landmark symbolizing this progressive, modern city and representing the pride of the nation. 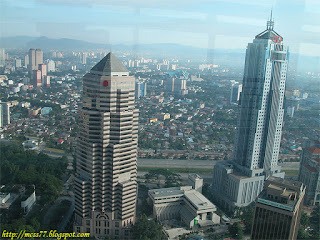 Taken from the Menara Tower. Outside the building is a park with jogging and walking paths, a fountain with incorporated light show, wading pools, and a children playground. It took 36,910 tons of steel to build the Petronas Towers. That's heavier than 3,000 elephants! It takes 90 seconds to travel from the basement parking lot to the top of each tower. Together, the towers have 32,000 windows. It takes window washers an entire month to wash each tower just once! After the tour, we visited the Gift Shop at the lower level just opposite the Skybridge Visit Entry Point. It is open everyday from 9:00 am to 6:00 pm.